Tapulous stumbles with its latest rhythm game. When Tapulous speaks, we usually listen. The popular iPhone developer created a small empire off its Guitar Hero inspired Tap Tap Revenge series, delivering addictive gameplay and hot music from such artists as Lady Gaga, Coldplay and Nine Inch Nails. 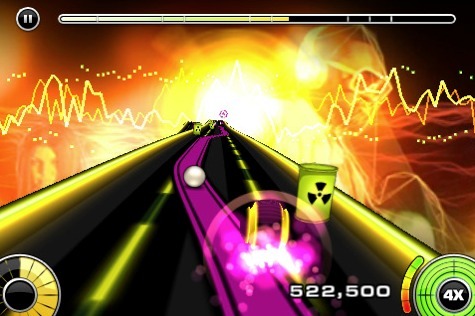 That's why we had such high hopes from the company's latest creation, Riddim Ribbon, a slick looking music fest that reminds us of Harmonix's Frequency and Amplitude. On top of that, hundreds of fellow iPhone users love it, so we forked over the $2.99 and prepared ourselves for musical euphoria. Unfortunately, we put it down after five minutes; naturally, for the sake of this review, we had to play Riddim Ribbon considerably longer. The game's designers cast you as a DJ who must guide a ball down a twisting piece of ribbon, making sure to remain on the highlighted track. Meanwhile, a song plays in the background, and you can remix it by moving to other highlighted tracks (you'll often see forks in the road). To do this, you tilt the iPhone left and right to move in those respected directions, and here's where the game's biggest problem rears its ugly digital head. The tilting is much too sensitive, making it nearly impossible to remain on a highlighted track as the ribbon curves all over the place. 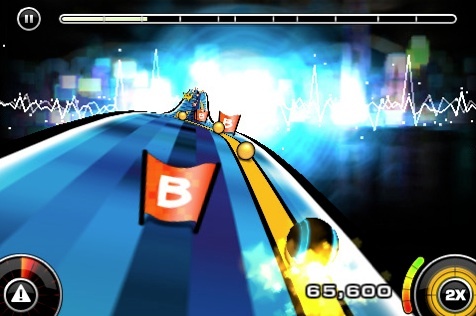 This becomes even more annoying as you veer off the path and run into obstacles like random Xs and barricades; doing this ruins the song and kills momentum. Tapulous must know about this issue, since it offers positive reinforcement for scoring a 68 percent out of a possible 100. On top of that, the announcer is by far the most irritating commentator since Bobito "DJ Cucumber Slice" Garcia in NBA Street: Vol. 2. He only serves to mar an otherwise stellar soundtrack by uttering "dope", "funky fresh dope" or whatever nonsense he spews. As for the soundtrack, it's excellent. Tapulous signed The Black Eyed Peas and feature three of the popular group's songs: "Boom Boom Pow", "Meet Me Halfway" and "I Gotta Feeling". In fact, if you purchase the game, you'll receive the song "Meet Me Halfway" for free, a nice incentive considering it costs $1.29 on iTunes. Other songs include two tracks from Tiesto ("Louder Than Boom", "Escape Me") and Benny Benassi's "Satisfaction". You'll just have to pay .99 to download each of them. We also think the graphics perfectly compliment the music. Riddim Ribbon pops off the iPhone's screen with the constantly streaming ribbon and plenty of greens, yellows and pinks in the background, complete with translucent faces of the musicians. It definitely has that Frequency and Amplitude vibe. It's just a shame that we don't have the patience to deal with the game's sloppy tilt controls. We really want to love Ribbim Ribbon because it features stylish visuals, a cool soundtrack and a fun concept, but until Tapulous makes some necessary tweaks, it'll remain ignored. We suggest you save the three bucks and wait for an update. What's Hot: The Black Eyed Peas, fun concept, attractive graphics. What's Not: Only three free songs, horrible tilt sensitivity, annoying commentary.